What I wanted to do, I didn`t already know how to do on Photoshop...which led me to spend over an hour looking up tutorials and videos on how to do it. And...I didn`t even end up doing what I wanted!! I did end up learning new things, but decided against my original idea. Sigh. I could`ve just made it simple from the beginning, since it just ended up being two simple ovals around my text. You think I would have learned this the first time around, but unfortunately, this was not the first time I`ve done this. Far from it! Hey, you can`t stop your curiosity, right? 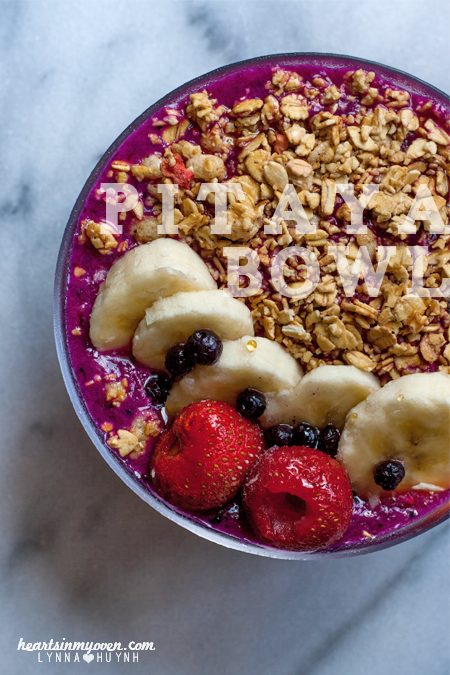 This pitaya bowl is very similar to the acai banana peanut butter bowl post I made awhile back. Where I live, these acai bowls have been on the rage for about 2 years now. They were cropping up everywhere awhile ago! Now, big chain juice stores like Jamba Juice and Juice It Up! offer them as well. Well, now, they have pitaya bowls, so I decided to try that at home as well! If you`re unfamiliar with the pitaya fruit, it`s also called dragon fruit. Growing up in an Easy Asian culture, this fruit was very popular. They are also popular in Central America, too! I`m not too sure if dragon fruits are "super fruits" since it seems like any exotic/foreign fruit seems to be nowadays, but they are delicious! 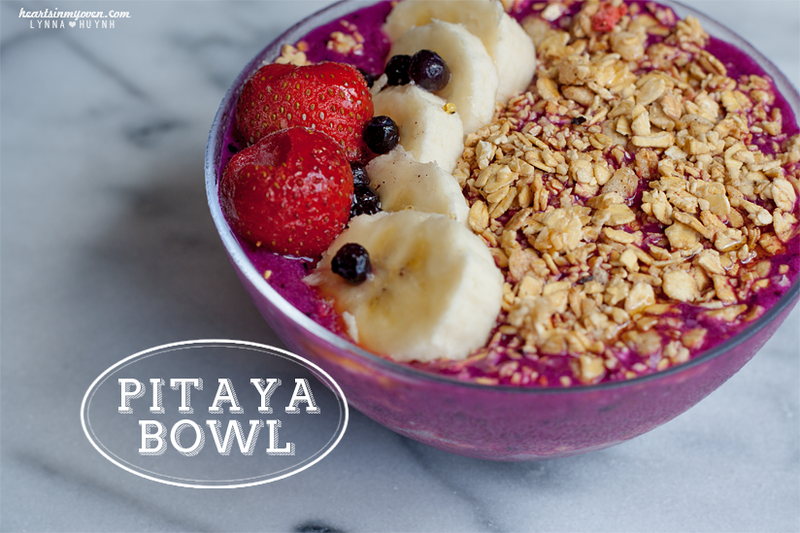 If you can`t tell, pitaya makes these beautifully bright fruit bowls! It`ll make you happy just eating it! And you`ll be happy since it was so incredibly simple and fast to make. Another .gif, because they seem to make the food more interesting. Hehe. 1. 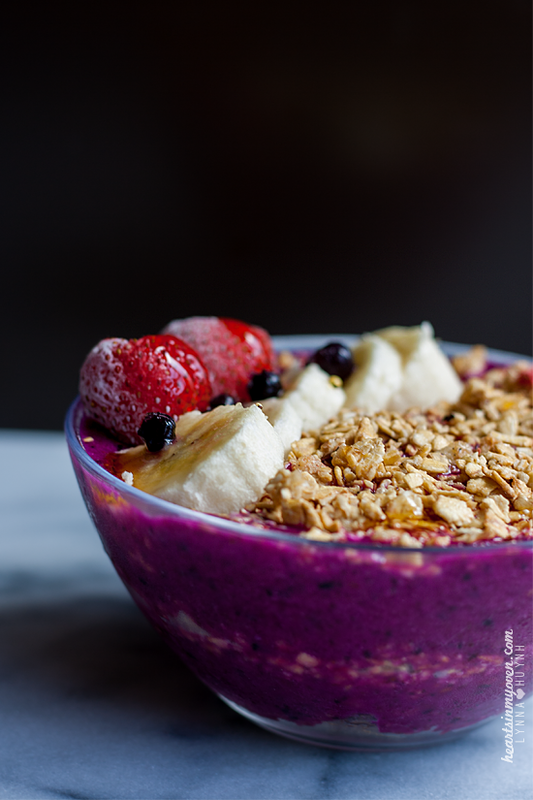 In a blender, blend together the frozen pitaya, 1 ½ the banana, frozen blueberries, and soymilk together. 2. Scoop half into a bowl. 3. Layer with half the granola/grape nuts. 4. Top with the rest of the pitaya mixture. 5. Top with granola and ½ of banana, cut in slices. - I used a combination of granola and grape nuts for some fiber. - I bought 1 package (4 individual packs) of 100% Raw Pitaya Plus frozen packets from Whole Foods. Try your local Whole Foods, or other similar markets for them. - Play around with the fruits, if you wish. Use milk, almond milk, coconut milk, coconut water, yogurt, and other frozen fruit varieties.